I can’t help wondering whether Dr James Gilligan feels himself to be in that special circle of hell reserved for academics — the one where, however clear and well-expressed your message, however startling and well-presented your data, no one actually listens. His book Why Some Politicians Are More Dangerous Than Others is a shocker, not least because it includes a call for the abolition of the US Republican Party (it seems he thinks it’s past repair). And I exaggerate in saying no one listened; it was multiply- and well-reviewed. Yet here we are, a year after publication … and damnit, the so-and-sos might even win the election. As one of our senior government officials here in the UK might have put it, but didn’t, Cavete plebes! Gilligan thinks that plebs — poor people, black people, any other citizens whose wives don’t drive a couple of Cadillacs — should watch out, because when Republicans get power their lives get worse. The core of the book is a graph showing how lethal violence rises and falls as the leader’s colours are red, or blue. Under Republican rule, unemployment, homicides and suicides go up, as do shame and humiliation; people’s feelings of belonging and being valued plummet. Under Democrats, these trends reverse. In short, if you aren’t one of the super-rich (the Republicans’ clientele, according to Gilligan, and others), you seriously don’t want to vote for these people. If you are, of course, the politics are just fine, because more unemployment is cheaper for your business, and wealth’s a great insulator from social stress. And yet, of course, lots of people do vote Republican, some of them super-poor. This is, apparently, because of the excellent propaganda and the divide-and-rule strategies of the GOP. Gilligan, as he admits, is not a politician (or an economist), he’s a doctor. Is this purely a US problem? In part, because, Gilligan argues, the US is much more influenced by an ‘honour culture’, or ‘culture of shame’ than other Western countries. It’s as if a strong dose of Enlightenment democracy and enormous amounts of money and weaponry somehow got mashed up with morals more like those of the Taliban. But to a lesser extent, the same patterns are also seen for other conservative governments in the UK, Australia and elsewhere. When the UK Labour Party adopted the slogan, ‘Things can only get better!’ perhaps they had a stronger point than they knew. Take note, non-American plebs. I admire clarity of vision, but it also makes me uneasy. This book is passionate, partisan, and strikes me as deeply well-intentioned, but its strengths are also its problems. For preaching to the converted, fine, but this is no way to convince opponents to change. Scientists often complain that people make irrational decisions, and it’s clear that Gilligan sees voting Republican as highly irrational, unless the voter’s Mitt Romney or one of his over-oiled pals. But any decision can look irrational when you haven’t considered all the factors involved. False consciousness may be part of the story, but my guess would be that the Republican party is giving its supporters something they genuinely want. Find out what that is, and supply it better, and support will ebb away without any lectures required. If that’s possible, of course. One of the allegations most likely to make a rightwing reader hurl the book across the room is that the Republicans have relied on intergroup loathing to build support, making sure even the poorest whites have someone to look down on. If this is correct, the Democrats need to discover alien life asap, and the more repulsive the better; then we can all unite in despising something. But again, I can’t help feeling, outsider that I am, that there has to be more to the GOP than xenophobic bigotry, or it wouldn’t have lasted so long. Alternatively, pray for a visionary Republican leader to read this book, study the history of his party (probably not her party; one step at a time), and haul the GOP back to where it once stood. One of the saddest aspects of Gilligan’s book is his sense of the path not taken; of how Republicanism’s early promise has soured. In this case, the shadow between idea and reality is abyssal. As Gilligan reports, he’s had political problems even with small-scale implementation of his ideas in prisons, despite good results in lowering recidivism. So good luck to whoever tries crossing the gap between his ideas and their implementation in national politics. The argument didn’t work. It rarely does. Too many people find attacking easier than negotiating, presumably because negotiation leaves room for the anxiety-inducing notion that they might not be right. 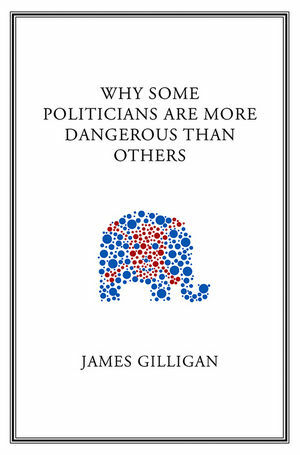 As for Why Some Politicians Are More Dangerous Than Others, it’s a well-written, easy-to-read, lucid, and extremely interesting book. Take a deep breath if you must, but I recommend it for thought-provocation. Not least because Gilligan’s approach — treating violence as a public health issue — is one that has already reaped rewards, and we’re likely to see more of it in the future despite politicians’ efforts, because even the stupidest political ideas will eventually rub up against reality. Unlike punishment, retribution, the death penalty and mass incarceration, the methods Gilligan advocates look like they might actually work. If, that is, they ever get past the political barriers. Someday, we might see the ‘evidence-based politics’ Gilligan longs for. But not yet. complete look of your site is usually excellent, aside from the information!